Rabdion gastrotaenia Bleeker, 1860: 286. Holotype: BMNH 63.12.4.25. 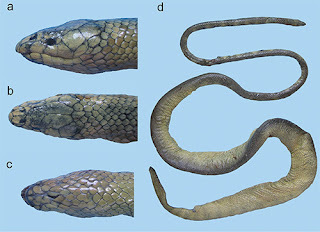 Note that RMNH 3977 from "O-I Archipel" (= East Indies Archipelago) is described as a “co-type” for this species, but it has been skinned and scale count data is therefore not available. No mention of syntypes is made by Bleeker (1860). Type Locality: “Amboina” (= Ambon), in error. Distribution for this species is suspected to be the island of Buru (Murphy et al. 2012). Oxyorrhos fusiformis Fischer, 1879 (1880): 89. Type locality: “…von Buru (Boeroe) im indifchen Archipel.” Note: Schlüter and Hallermann (1997) suggested the syntypes (SMNS 1327–3) were lost in World War II. Brachyorrhos albus – Boulenger, 1893, 1: 305. Note. Murphy et al. (2012a) found Bleeker’s type most closely matches the specimens of Brachyorrhos from Buru and applied this name to that population, commenting that there were some discrepancies in the ventral and subcaudal counts. Thus, there may be two or more species of Brachyorrhos on Buru. Diagnosis: A fangless homalopsid. Six upper labials, fourth (rarely 3+4) in orbit, fifth is tallest; mid-ventral stripe often present. This combination of characters separate this species from all other members of the genus.